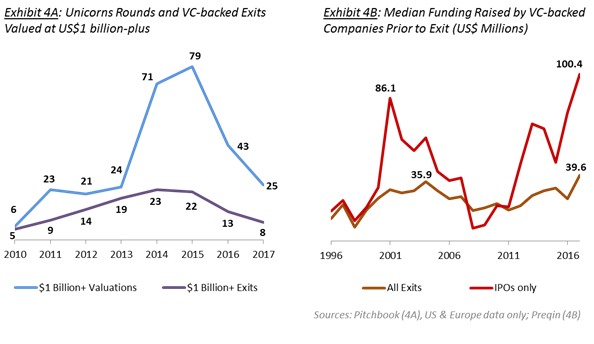 Traditionally, venture capitalists have provided small sums of capital in staged funding rounds to nurture and test the viability of disruptive, high-risk business models in an entrepreneurial environment. Recent data indicate that this role remains alive and well and has in fact thrived over the past decade. 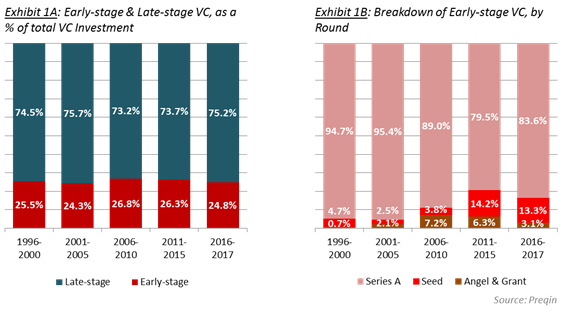 More accurately described as early-stage venture capital, this segment of the market has maintained a remarkably consistent share of total VC investment volume since the late 1990s (Exhibit 1A), reflecting its rapid growth alongside the larger end of the VC market1. 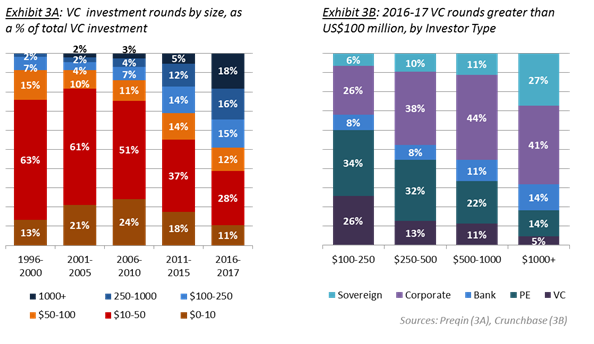 Large and mega VC rounds have been dominated by a new set of players that are becoming increasingly involved in VC-style investment, namely sovereign and corporate investors (Exhibit 3B), as rounds of investment over US$500 million exceed the mandate of all but the largest PE and VC players2. By far the largest sovereign and corporate investors in these rounds are Chinese, notably Alibaba-linked entities and various Chinese state-owned financial institutions. 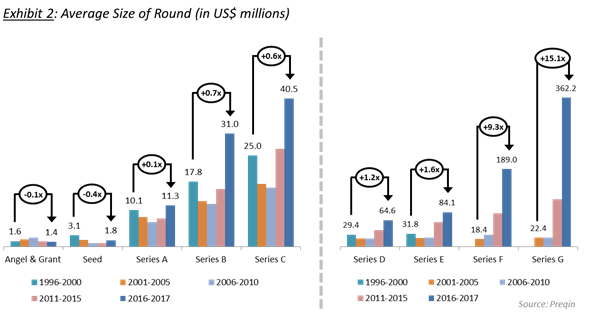 Softbank and Singapore government-linked entities also participated in a significant number of large rounds, while other corporates largely invested in start-ups aligned with their core businesses.